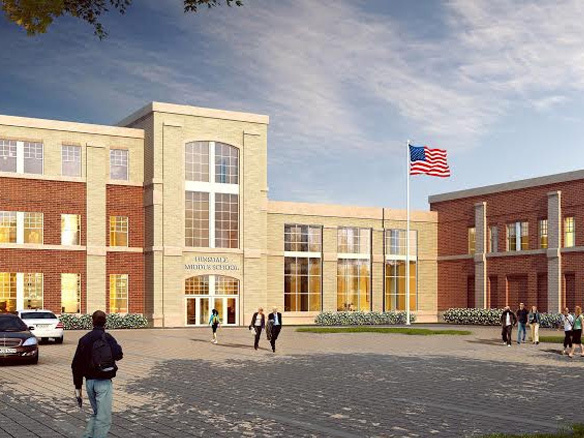 The Hinsdale Middle School (HMS) conceptual design main floor includes nine core classrooms, a STEAM lab (science, technology, engineering, art, and mathematics), the gymnasium, locker rooms, cafeteria, school administrative offices, student services area, Media Resource Center (library), band room, orchestra room, choir rooms and various practice rooms, and a 500-seat auditorium which can be used for instruction, assemblies, presentations, and performances for all D181 schools, as well as a variety of community groups. The second floor includes 19 core classrooms, the fitness center, an elevated running track, the applied technology classroom, several spaces for small group instruction, and open areas for staff and student collaboration. The current building’s fitness center is housed in a former storage closet; the proposed design makes appropriate space for this area, which is used during Physical Education instruction. The elevated running track would help to offset the lack of outdoor space on the building site, and it would provide an opportunity for physical activity for students who may be unable to otherwise participate in P.E. The running track would also be available to the many community organizations that use our District 181 facilities during the year. The third floor includes 11 core classrooms. Shown in bright green below is an area that could potentially become a “green roof” that would be accessible to students and staff for instruction and collaboration. The design keeps the third floor on the downtown side (north side) of the building so the resident side (south side) appears as only two stories. The height of the third floor is approximately 7 feet lower than the current building. The lower level has space for mechanical/ electrical equipment and a custodial work room. The District data center that is currently housed at HMS would be located in the lower level, as well. If the referendum is approved, we plan to seek alternate bids for potential excavation of a basement area that would remain unfinished. Should enrollment or instructional programming warrant the need for additional space, the area could be converted to classroom space. In the meantime, it would serve as an ample storage area.